I did some exercises with a kettlebell yesterday. The more I use it the more I fall in love with it. I don’t know what it is exactly, but the challenge of using it brings me excitement, unlike with pull-ups, dumbbell squats or lunges — I hate these with everything in me (which most likely means they are exactly the exercises I should be doing the most, duh). 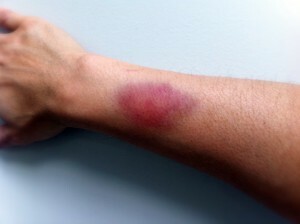 Just today I woke up and I’ve noticed horrible bruises on the outer side of my wrists. What’s even more weird is that they don’t look like a usual bruise, more like a burn. Obviously they have a bit of a bittersweet aspect: unpleasant signs of small accomplishments. I’ll be reading how to use a kettlebell properly over the weekend.